5th Year Politics and Society students were invited to the Dáil last Friday 20th October to meet Parliamentary Education Officer, Conor Reale. The group spent some time in the committee room debating lowering the voting age to 16. Finian McGrath TD and Minister of State for Disability Issues also spoke to the students about the work of a TD and some of his responsibilities as Minister. It was a thoroughly enjoyable trip for all and certainly inspired some of us to consider future careers as leaders. The Maryfield College Debate team successfully opposed the motion “Individuals serious about climate change must give up eating meat” in their first debate this year of the Concern Debates series. The team debated against Moyle Park College and enjoyed exchanging thought-provoking ideas before the judges brought back their unanimous decision in favour of Maryfield. The prefects held their first fundraiser of the school year on Friday 12 October. This purpose of the event was to raise funds for St. Francis Hospice and also to remember our dear pupil Ciara Hawe. €1,765 was raised on the day and we all enjoyed looking pretty in pink! The Maryfield Global Issues were delighted to have been invited to Iveagh House on Friday 7th September to meet Amina Mohammed, Deputy Secretary-General of the United Nations to share the outstanding work they have done on raising awareness of the UN Sustainable Development Goals. The students also had the opportunity to meet Simon Coveney, Tánaiste & Minister for Foreign Affairs and Trade. 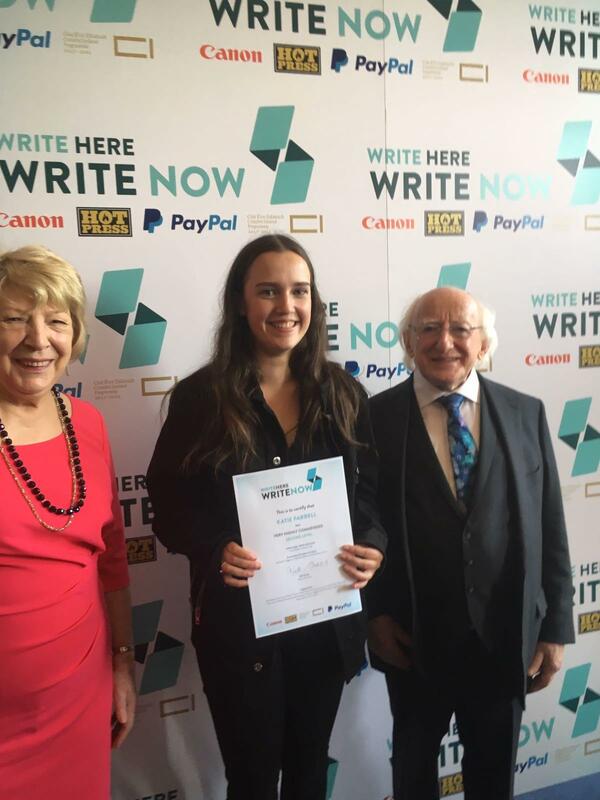 Congratulations to Transition Year student Katie Farrell, who received the award for Female Second Level student from the “Write Here, Write Now” Writing Competition. This competition is presented annually by Hot Press Magazine, in conjunction with Creative Writing Ireland and the Irish Writers Centre. Katie was presented with the “Very Highly Commended” award by the Most Honourable President Michael D. Higgins at the Irish Writers Centre on Monday the 28th May. Katie also won an award for her writing from Trinity College Dublin earlier in the year. Well done Katie! Our 6th Year graduation day took place on Wednesday 23rd May. This was a wonderful celebration of the students’ five or six years spent at Maryfield. The day included a ceremony in the school hall and mass in Marino church, followed by a reception back at the school. We wish all our 6th Year students the very best in their upcoming exams. The Transition Year musical, Aladdin, took place on the 21st and 22nd of May. Well done to all involved in staging a truly memorable and enjoyable production. Three First Year science students, Martyna Baran, Anna Kendellon and Lara Phipps, represented Maryfield College in the Salters’ Chemistry Festival held in Trinity College on Saturday 21st April 2018.This is an annual event held in the Chemistry Department of Trinity College to promote science among First Year students. This year twenty-four schools participated in the festival. 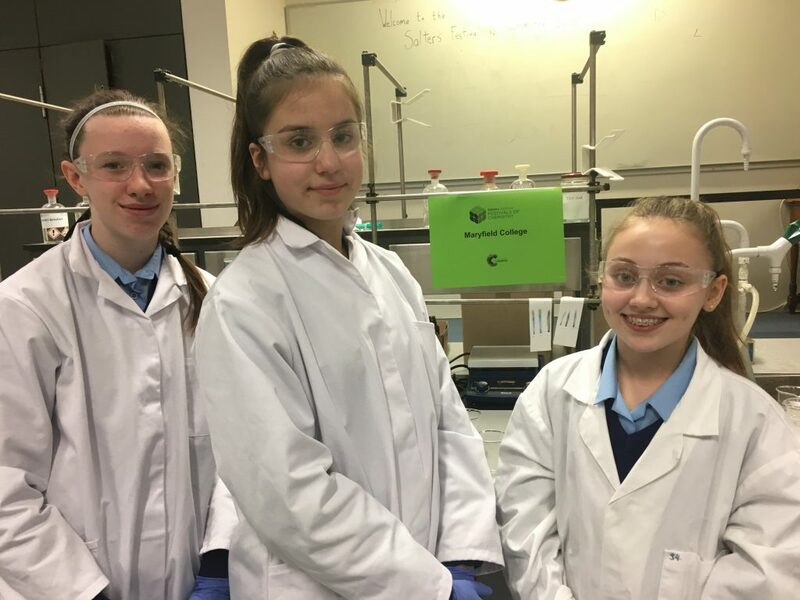 The three Maryfield students won first prize in the Salters’ Challenge and according to the judges they obtained one of the highest marks ever awarded for this Challenge. We congratulate all our Maryfield competitors in SciFest@DCU 2018. SciFest is an all-inclusive, all-island science initiative which fosters active, collaborative and inquiry-based learning among second-level students. It involves second-level students showcasing science, technology, engineering and maths (STEM) projects at a series of one-day science fairs. We are very proud of our eleven students who represented Maryfield so well at this prestigious festival. Well done to all! Maryfield competitors: Ramsha Owais, Charlotte Velasco, Ava Flynn, Elle Cooper, Holly Donnelly, Elycia Flood, Anu Thomas, Sarra Ryan, Róisín Brennan, Viktorija Cvetkove, Leah Wu.